Values & Ethics: From Living Room to Boardroom is the challenging, thought-provoking conversation-starter you’ve been looking for. It will bring you to a place where dialogue thrives and ancient wisdom and progressive thinking are brought to life. 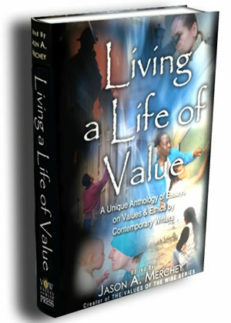 This most recent addition to the Values of the WiseTM Series will help you escape the world’s hustle and bustle and think about what truly matters: a life of value. Winner: Best Book Award – Social Change. Click here for a free 50 page preview! Available as a Soft Cover Book, Kindle eBook, or Downloadable PDF. Soft Cover Book now 10% off! This unique new book combines classic and incisive quotations with interesting interviews conducted by Jason Merchey. It aims to address big-picture topics such as values, virtues, ethics, and wisdom. The interviewees are learned, eloquent individuals who engage in questions and answers on the big questions of life. The goal is to encourage original and critical thinking about enlightenment, personal growth, progressivism, and more. The book extols the power of philosophy and of learning to make one’s life better—more interesting, more profitable, more livable, more meaningful. This impressive work covers many subtopics — from economics to politics, from philosophy to personal growth. Capitalism, liberty, character education, progressive politics, and integrity are but a few of the subtopics explored. All books are signed by the author and are returnable if you do not find value in them.